At around the time of Sunny's death last year, Oscar was diagnosed with an over-active thyroid. He needed medication for that and took other tablets at the same time, to support his kidneys (which would be under greater strain once his thyroid started functioning). He was prescribed a special renal diet, which presented the greatest shock to him - as the serving size was just a quarter cup of kibble per day! These heavily reduced quantities did not impress our food-focussed feline at all! In those early days he would wake us during the night to protest the emptiness of his food bowl. He was also known to rummage for the tablets he did like and try to take extra! (The disliked tablets were regularly spat out when he thought no-one was looking)! Oscar was definitely a character. When I met Nick, he and Oscar lived in a tiny fibro cottage by the river. Oscar wore a belled collar, to try and afford the resident wildlife some warning of his presence. Oscar would ring his bell at the front door to be let in, saunter the few metres to the back door and ring again to be let out! Nick and I joined households in early December 2004. Oscar arrived later in the month, on Christmas Eve (which caused a lot of merriment at the time). 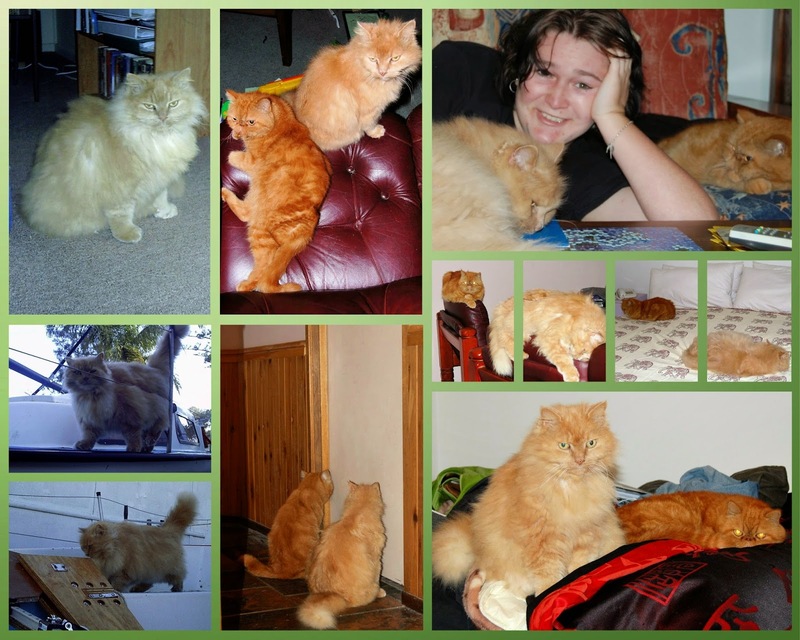 He and Sunny initially had a few altercations but generally existed happily after that, though they preferred to pretend they didn't like each other (and would look guilty if sprung together)! Oscar's had a few close-calls during his life. We kept him confined following removal of a large tick, not really expecting him to survive the poison. After a week of isolation, he staggered out of the upstairs bathroom and made his way onto the first-floor balcony, before jumping down to the ground! So much for keeping him resting quietly! (He later survived two dog attacks in 2008 - the second on Christmas Eve). No doubt his determined spirit helped him adjust to our many addresses, including relocation to Victoria in December 2012. (On looking back in seems Oscar experienced quite a few significant events in December of various years). During our first few months as Victorians, both cats stayed with family and were quite spoiled! Our cats later moved with us to Hamby Home(in)stead in early March last year. In his younger days Oscar was a very large cat and his spirit remained so - as he wasn't at all shy of taking on Tea when he felt she was being too forward! Possibly Oscar's biggest adventure was coming with us to Yowah for our ten-week holiday earlier this year. He was given some cat-harness revision in preparation, then travelled in a small cat-box, stacked under Keegan - with frequent rest breaks. 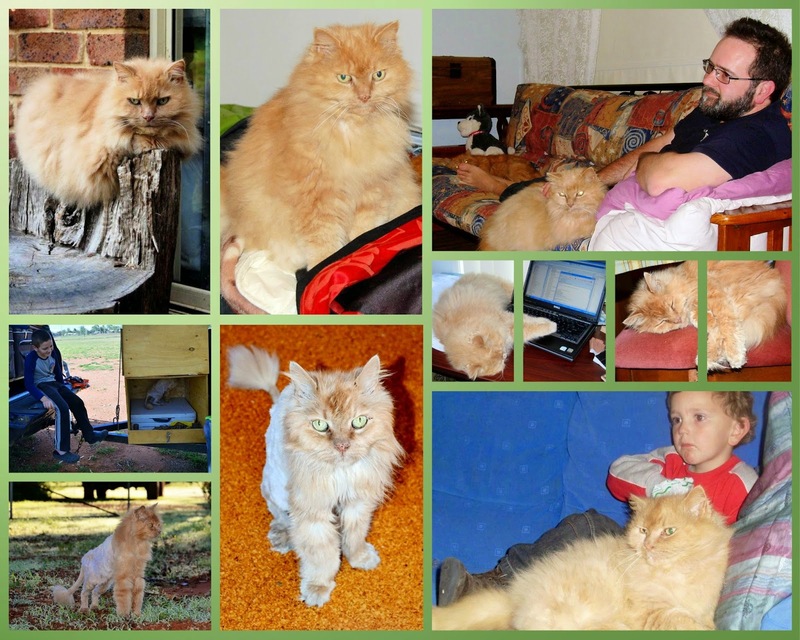 Oscar really seemed to enjoy camping at Cobar and generally behaved as a much younger cat while away. He chased bugs and grasshoppers and appreciated the warmer climate. He must have really felt better because he even washed his face! We've been home since early May. 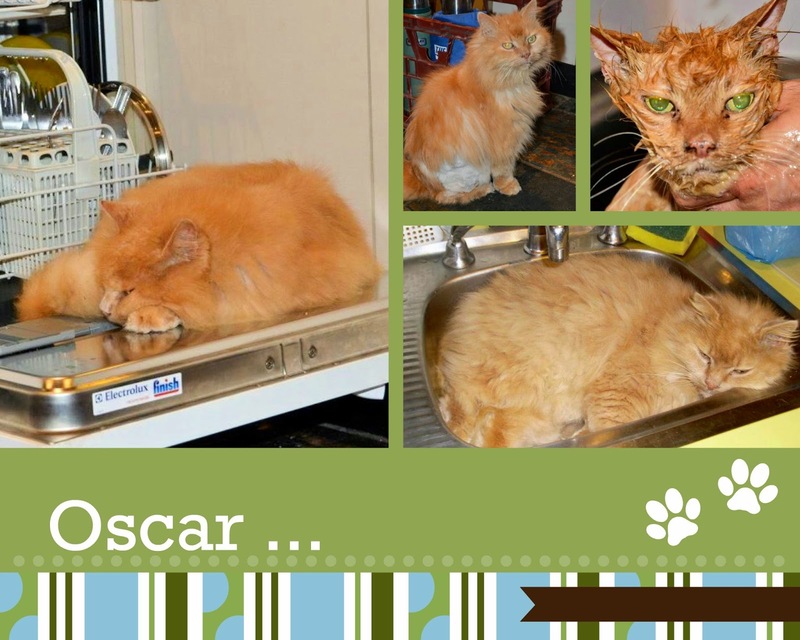 Oscar has had several trips to the vet during those months. His medication was increased but his condition continued to fail. A few days ago he stopped taking his medication, even the tablets he liked. I'm glad Nick and Vaughan were with him as he finally faded away. We buried Oscar this afternoon, next to Sunny (but not too close)! In time we'll build a rock stack as their memorial.